Water is crucial for our survival as humans – we can only last for 3 to 4 days without it, but potable water is not always available. There are high-tech purification methods such as desalination and reverse osmosis, but these methods are geographically limited and are not necessarily portable. So, a simple, non-high-tech water purifier can be a life saver in emergency situations at places where there is no means to access potable water. The hydrological cycle, which acts as a natural water purifier, has inspired the simple mechanism used by solar stills – a man-made non-high-tech water purifier. Solar stills can be used in poverty-stricken areas, in deserts, at sea, and to help reduce energy costs and pollution as stills are environmentally friendly. The Aquamate inflatable solar still utilizes the sun to turn contaminated water into freshwater. Ideal for ocean trips. Full review at end of article. What is a Solar Still and What is it Used For? A solar still is an artificial water purifier that imitates the natural mechanism used by nature to purify water. 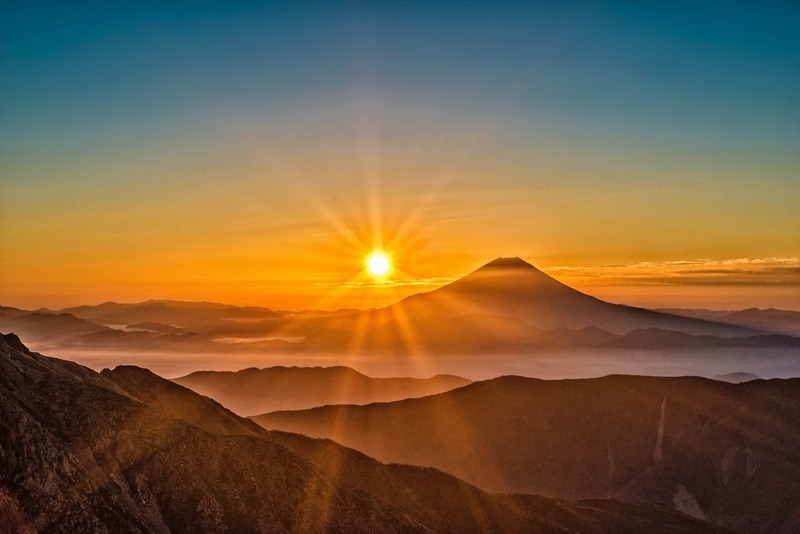 Like the natural hydrological cycle, the sun drives the process of purification. 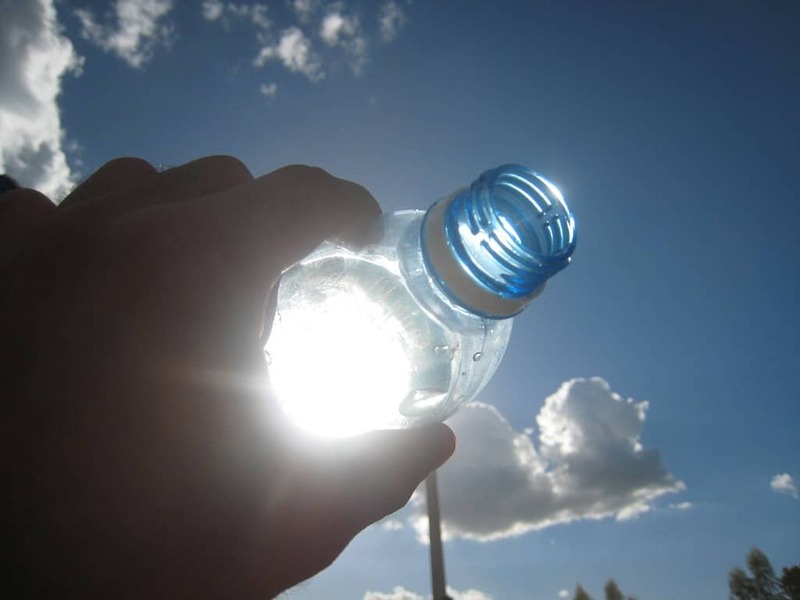 A solar still distills water using energy from the sun. The sun evaporates dirty water which is then cooled and collected in pure form. It does not use fossil fuels as a form of energy. Unlike many artificial methods of purifying water, solar stills use solar energy to purify water. The obtained purified water is potable – safe for drinking and cooking. The main purpose of a solar still is to remove impurities from sea water or contaminated water by extracting pure water without using an external source of power. Stills leverage energy from the sun as opposed to fossil fuels by retaining enough heat from sunlight to form pure water vapor. The pure water vapor is then collected and condensed to liquid form as it cools. The purified water can be used for drinking, washing clothes and utensils, bathing, cooking and emergencies during water shortages and natural disasters where there is no access to clean potable water. The mechanism solar stills use is similar to that of the hydrological cycle. 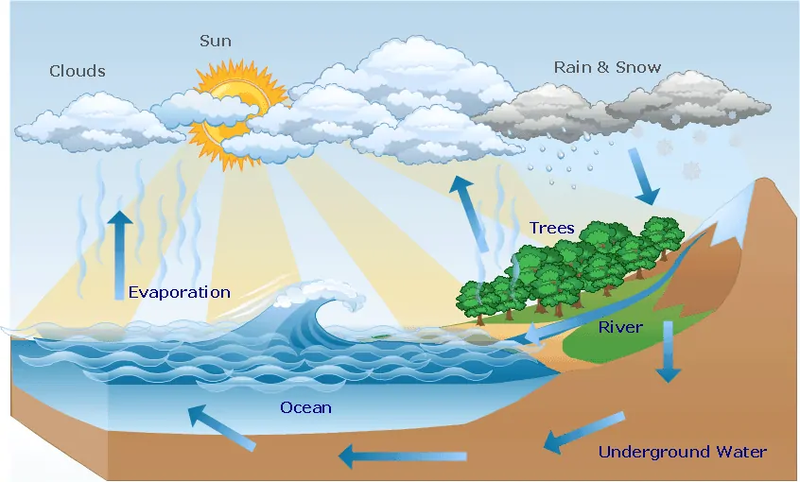 Considering the ocean and other water sources exposed to the sun, saline water is evaporated from the surface and the vapors get trapped in the clouds. The trapped vapor then condenses to liquid form due to the partial pressure developed. The condensed liquid is what we refer to as rain – a natural way to get fresh water. 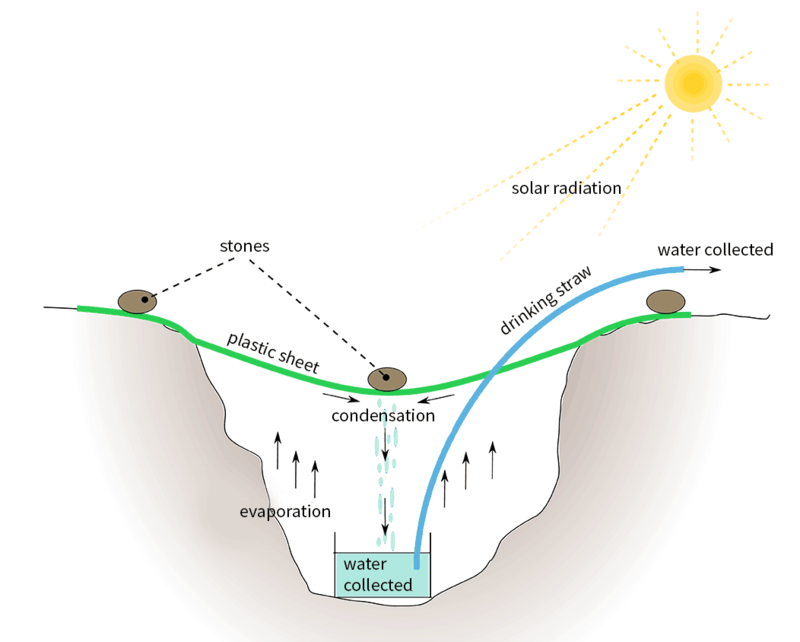 A basic solar still typically consists of two water troughs – one water trough is filled with contaminated water and the other is kept empty to collect purified water. A piece of glass is placed across the top of the contaminated water trough, angling directly down into the empty water trough. The bottom of the water trough filled with contaminated water is usually covered with black paint to help absorb solar energy from the sun. 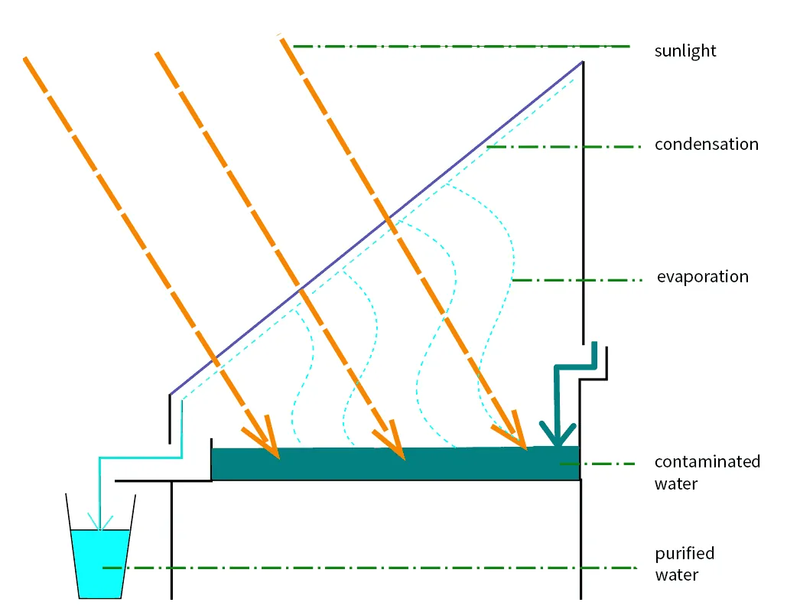 Solar stills distill water using the two main scientific principles of the water cycle – evaporation and condensation. This is the first main step of water distillation. It acts as a mechanism to separate pure water from the impurities. The dirty water is left to sit in the sun, allowing it to absorb solar energy. The water begins to heat up as the energy is absorbed. As the temperature rises, water is converted to steam – the purified water that needs to be collected. Solar stills assume that all impurities have higher boiling points than that of water, so certain contaminated water with impurities having a lower boiling point than water are not suitable. The generated steam then moves towards the glass ceiling, leaving behind the impurities in the water trough. This is the second main step of the distillation process. Once the evaporated seam hits the glass ceiling, it begins to condense as it loses energy in the form of heat. The condensed steam results in pure water droplets. The water droplets flow down to the empty water trough due to gravity as the glass ceiling is angled downwards. The pure water collected in the empty trough is free from minerals, bacteria and other substances which are unable to evaporate with the pure water. What Types of Solar Stills Are There? This type of solar still holds the dirty water in only one basin, and it has only one fresh water outlet. The shape of the cover may vary as there are different types of single basin solar stills – concave (concave wick solar still), hemispherical (hemispherical solar still), pyramid (triangular pyramid solar still), spherical (spherical solar still). Solar stills may also be integrated with an electric or solar heater (solar still integrated with heater) to help increase the basin water temperature. This type of solar still consist of more than one basin holding the dirty water to be purified. The additional basins are made of glass to allow solar radiation to reach the lower basins. The number of basins may vary – two basins (double basin solar still), three basins (triple basin solar still). The shape of the cover of topmost basin may also differ – pyramid (triple basin pyramid solar still), flat and angled (single slope double basin solar still). Solar stills can be an emergency survival tool, even for gathering water from the driest deserts during the most brutal seasons. So, learning how to make a solar still can be a lifesaving skill. With this solar still, solar energy heats the ground by passing through a clear plastic barrier. The moisture from the soil then evaporates and gets condensed and collected on the underside of the plastic barrier placed above. A plastic tube, a shovel and tape are optional. If loose vegetation is available, place the leaves inside the pit but do not obstruct the container. This will add moisture to the distillation process. Place a small rock in the center of the sheet, just above the water container. Push down the weight gently until the sides slop to an angle of 45o. Secure the edges of the plastic sheet with rocks and dirt to prevent the escape of moisture. Close the tubing end with a knot or tie it closed, if used. Wait 24-48 hours. Do not open the plastic sheet or the moisture will escape. This type of solar still without vegetation can produce anywhere from a few hundred milliliters to 1 Liter of water in a 24 hour period, depending on the weather, the moisture in the soil, and the size of the still. Adding vegetation and creating a larger still can increase the amount. What are the Benefits of Solar Stills? PH levels remain the same unlike commercial water-boiling plants. When water is boiled, the PH level drops dramatically, resulting in flat-tasting water. However, with solar stills, the PH level remains balanced as water is purified naturally. It is a relatively low costs method for water purification as small quantities of energy is required, which is collected from the sun. Non-conventional energy (solar) is used. There are several disadvantages including the amount of time it takes to produce a relatively small amount of clean water, but in a survival situation, any amount of water is necessary. Despite its flaws, solar stills can still play a critical role for survival in emergency situations where there are no alternatives for obtaining potable water. 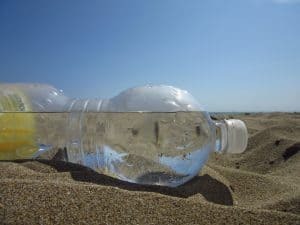 What is the Best Solar Still I can Purchase? While it is handy to know how to make a solar still if you're ever in a tight situation, nothing beats a professionally manufactured still designed to produce the most amount of water possible. 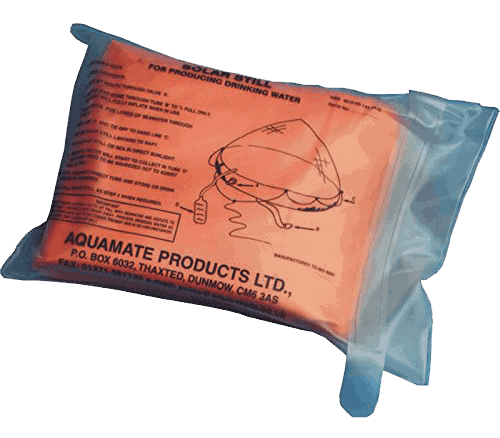 This inflatable Aquamate solar still is a great choice for emergency water purification. It provides an inexpensive way to extract pure water from sea water and contaminated water, including urine. Solar energy from the sun is used as the source of heat, so no power is required. A solar still typically consists of several components, but this solar still takes away the hassle of placing all the required components together. 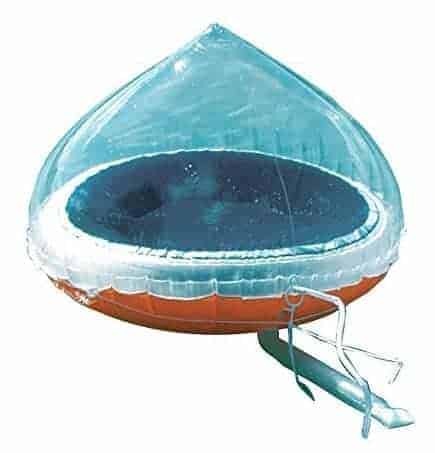 Simply inflate the still by mouth, fill it reservoir with sea water or contaminated water, then let the sun take care of the rest. Solar stills are a great way to purify water naturally with energy from the sun and they have saved many lives over the years. Stills can be bought or easily made as described above. There are many benefits in terms of financial and environmental costs, but there are some disadvantages such as inefficiency. However, the pros outweigh the cons in emergency situations. Nevertheless, researchers continue to look for ways to improve the efficiency with different designs. Thank you for taking the time to read our article on how to make a solar still. We'd love to hear your feedback in the comments section below. If you've found this article to be useful and are interested in learning more, be sure to sign up for our newsletter.